Jacob Markstrom: Back On The Radar? It’s been a strange ride through professional hockey for Vancouver Canucks’ prospect Jacob Markstrom. The 24-year old netminder has gone through the best of times to the worst of times in his professional career. The Swedish youngster was at one time the most coveted goaltending prospect in the world. 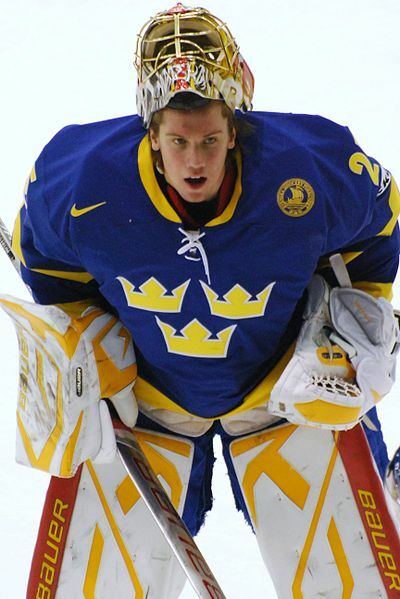 As a teenager, Markstrom was the best netminder in Swedish professional hockey. Since coming to North America, he’s struggled to find his game. After being the first cut in this year’s Vancouver Canucks’ training camp, Markstrom has dominated the American Hockey League while playing like a man possessed. This phoenix could be rising in Utica. Markstrom has posted two shutouts and allowed only one goal in his first three appearances for the Canucks’ AHL farm team Utica Comets. The most promising aspect of this dominance is noticeable refinement of his game. Since arriving in Vancouver, he has become the project of Canucks’ goaltending coach Roland Melanson. Working with Melanson and Comets’ coach Dan Cloutier, Markstrom has been improving his game. Former Canucks’ head coach John Tortorella on Roland Melanson’s work with Markstrom. “Really the biggest thing Rollie is trying to do is get him deeper [in his crease],” Tortorella said in late March. “He’s a really athletic guy, he’s a big man. He’s trying to get him to play deeper. Again, I don’t spend too much time asking questions, but he’s trying to change his game a little bit. The eye popping early start to the season is quite a boon as his future was beginning to be questioned. After going through a nightmarish season to conclude a rocky four year tenure with the Florida Panthers last year, he was traded to the Vancouver Canucks late in the season. Getting lost in the goaltending shuffle on the deck of the Titanic that was the Canucks’ 2013-2014 season, Markstrom only appeared in four games for his new team. Critics questioned whether he would ever be able to fulfill the potential he was once thought to possess. These concerns were exacerbated when Markstrom was placed on waivers as the first player demoted from the Canucks’ roster at training camp this year. He cleared waivers and was assigned to the Canucks’ farm team in Utica. This move was later said to be Canucks’ general manager Jim Benning’s attempt to sneak him through waivers. This story gains credence when the only game he played in camp was a secretive affair against the San Jose Sharks that wasn’t broadcast on any medium. Hockey insider Renaud Lavoie on being waived by the Vancouver Canucks. Jacob Markstrom was having a great camp. They did not want to expose him in games. Canucks are happy to see him stay in the organization. Markstrom seemed destined for greatness as early as 17-years old when he made his first dramatic appearances in Swedish professional hockey. Winning the number one job for Bryna in Sweden’s top professional league at just 18-years old. Markstrom spent his teenage years dominating world junior tournaments and carrying his SEL team out of the basement to respectability. The Florida Panthers selected the teenage phenom 31st overall in the 2008 draft. At 20-years old Markstrom arrived in North America in 2010. Bouncing between the NHL and the AHL with the Panthers’ organization, he showed flashes of brilliance in the AHL. Yet he struggled to find consistency or a regular job in the NHL. Markstrom also struggled through injuries and having to compete with veterans for playing time. Markstrom’s time with the Panthers came to an end last season when he couldn’t wrestle the number one job away from veteran Tim Thomas and was demoted to the AHL. Soon thereafter he was traded to the Canucks. A cloudy end to the Florida Panthers’ one time goalie of the future. Possible #1 NHL Goaltender? Reply Hazy, Try Again. The main word that comes up in every scouting report is “raw” when describing Markstrom’s game. Boasting impressive size at 6’6 and unreal athleticism for a man his size. Markstrom has all the physical attributes to be an elite goaltender. Yet he has been enigmatic at the top level with wildly inconsistent performances going 12-27-5 with a sub-par .898 sv% and 3.19 GAA during his NHL career. Markstrom may have landed in the perfect situation to resurrect his career. Vancouver has transcended from goalie graveyard to goalie factory having produced and improved a number of NHL netminders. The Canucks also boast a stacked system of blue chip goaltending prospects. Proven to be one of the best at developing goaltenders, the Canucks can take the time to develop Markstrom’s game. But the question remains on whether he will ever live up to his one time hype. Early returns this season say that it could still be a possibility.